1. 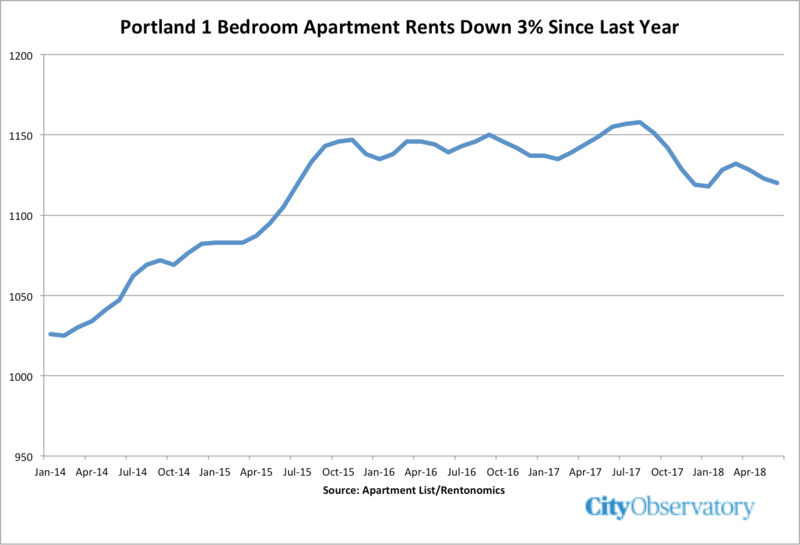 Portland rents are going down. There are those who are skeptical that we can “build our way to affordability.” But the economic evidence suggests that’s exactly what’s happening in Portland. New apartment construction in the Rose City is finally catching up to demand (there’s a long lag between increased demand and more new housing). ApartmentList.com reports that the average rents for a one-bedroom apartment have declined 3 percent year-over-year. In addition to lower sticker prices, many landlords are also offering off-the-books inducements like months of free rent. While the current construction boom promises to add to the housing supply and put further pressure on rents, a misguided inclusionary zoning requirement could stifle further growth after 2019. Will policy makers learn from the evidence the market is producing right now? 2. Why congestion pricing makes sense for Portland. 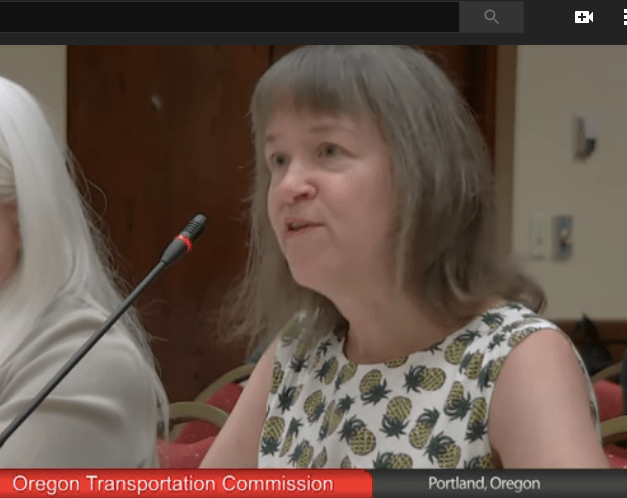 We turn the City Observatory microphone over to Chris Hagerbaumer, Deputy Director of the Oregon Environmental Council, who recently testified to the Oregon Transportation Commission on the merits of congestion pricing for Portland area freeways. 3. The limited allure of small towns. It’s regular fare from your contrarian journalists: Forget what you’ve heard about millennials moving to cities, here are some instances in which a young professional has grown tired of the crowding and expense of urban living and de-campled to a tiny rural town. This week’s installment is from Slate, which tells the story of independent film maker Joel Levinson, who’s moved from Los Angeles to Yellow Springs, Ohio (pop. 3,500), and continues to crank out award winning films. What this leaves out, of course, is that Levinson put in a decade in Los Angeles honing his craft, building his resume and making invaluable contacts. Statistically, cities help young people find careers, build skills and become more productive, which is why even more smart young people live in cities now than ever before. A select, older few, having acquired skills and built networks may, later in life, move to a small town, but cities have become even more powerful and alluring engines for economic success. Both sets of my grandparents were able to establish excellent footholds into the American Dream, just like so many other families in America. But their ability to pass that dream onward and upward faced constraints that other families didn’t have to face. . . . There was no transfer of generational wealth from my grandparents to my parents. . . . There was no transfer of generational wealth from my parents to me and my siblings, either. . . . what happens when communities are allowed to decay to the extent that Detroit’s East Side and Inkster have? There’s no chance at intergenerational transfer. Saunder’s story is more than just an anecdote; the empirical data show that whether homeownership help builds wealth varies dramatically by race (see our New Knowledge story, below). 3. Community preference policies: Curing displacement or fostering segregation? Writing at The Urbanist, Natalie Bicknell has a thoughtful review of the promise and pitfalls of using resident priority programs to fight displacement. The idea behind these programs is that existing neighborhood residents ought to be given preferential access to new affordable housing constructed in a neighborhood. Variations of this idea have been tried out in New York, San Francisco and Portland. While appealing in theory, these policies bump up against the reality of segregation: granting preferential access to existing neighborhood residents tends to reinforce patterns of segregation. In New York, a group of prospective tenants (persons of color) filed suit against the preference program because it reduced their opportunity to move to higher opportunity neighborhoods in Manhattan. The federal government weighed in against an early version of San Francisco’s residential preference policy, arguing in violated fair housing laws. In both San Francisco and Portland, preference programs have resulted in a relative handful of affordable units going to households with long connections to the neighborhood. It’s a complex and difficult area for policy. Planetizen featured our story on rents declining in Portland, thanks to the recent increase in apartment construction. In its article, “Why are developers only building luxury housing,” Strongtowns quoted our commentary on housing affordability, showing that continually building new housing, even if at higher prices points, causes existing housing to become more affordable. Bike Portland highlighted our commentary on America’s “secret socialism” when it comes to car storage.